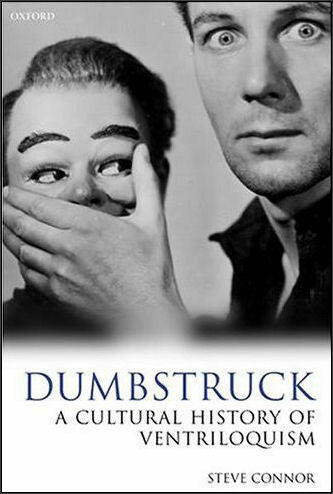 Dumbstruck: A Cultural History of Ventriloquism was published by Oxford University Press in October 2000. 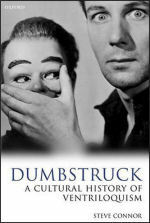 This site makes available the Dumbstruck Archive, of texts and images relating to the history of ventriloquism. Order the book from Amazon or Oxford University Press. Read Chapter One, 'What I Say Goes'. Interview with Enzo Mansueto, Rodeo, 43 (2008): 66. Sound Stories - discussion of ventriloquism for RTÉ Radio 1, 9 September 2008. I suggest that the dissociated voice is a recurrent source of excess, menace and awe. Because it is a category of excess, a figure of nonfigurability, it has no one meaning. No conclusions can be drawn regarding the nature of the ventriloquial voice, because its essence is to be against nature. My concern is rather with the recurrent shape of the question asked and answered by the dissociated voice. Nor is the ventriloquial voice pure exorbitance or disruption; like the neurotic symptom, it is both wound and cure, enigma and explication, trauma and therapy. The dissociations and resituations of the voice are always a matter of power. Firstly, the dissociated voice of ventriloquial fantasy mediates between the body and language, which is to say also between the body and culture. The variability of the voice's origin, whether magically detached from the body, or erupting from illegitimate orifices, means that the ventriloquial voice is both an attempt to imagine and pit the the speech of the body against the speech of culture, and an attempt to control that illegitimate speech, to draw it into discourse. It is for this reason that the ventriloquial voice is associated both with challenges to political authority, and with their reassertion. For the voice is the mark both of the self's presence to and its estrangement from itself; the ventriloquial voice enacts the strangeness of the self's self-presence. Secondly, the voice is crucial to the process whereby, in modern societies, political questions have come to be focused in the question of the subject, and more specifically its threefold articulation of self, socius and voice. The modern subject who must learn to internalise power, gives itself the law through the medium of the voice, of the system of self-speaking and self-overhearing that Jacques Derrida has named `s'entendre parler'. In a mirror image of this process, the state or the socius enacts its authority through the process of speaking for and through other subjects. Ventriloquism is both the guarantee of this system and a threat to it. Nowhere is this better enacted than in Charles Brockden Brown's Wieland, a novel in which a sinister ventriloquist wreaks havoc in a rational community in Pennsylvania. The question that the novel asks is `where does the authoritative voice come from, and whence does it derive its authority?'. It is the question that is both anxiously asked and prematurely answered in the Declaration of Independence of a decade previously. The declaration declares that it speaks for and as the independent nation; its authority lies in the fact that it declares itself, declares its declaration. But, since the declaration also speaks on behalf of those it represents, it must also declare that its authority comes from elsewhere, from some source (the people) that is not known and present at the moment of declaration. Ventriloquism is thus both the legitimating glue of the new republic inaugurated by the Declaration of Indpendence, as it comes to be the binding principle of modern democratic states; and the solvent of that authority, insofar as the mobility of the voice always puts in doubt its authoritative origin. Review of Janet Beizer, Ventriloquized Bodies: Narratives of Hysteria in Nineteenth-Century France (Ithaca and London: Cornell University Press, 1994), Women: A Cultural Review, 6.3 (1995): 327-31.
Review of Embodied Voices: Representing Female Vocality in Western Culture, ed. Leslie C. Dunn and Nancy A. Jones (Cambridge: Cambridge University Press, 1994); Felicia Miller Frank, The Mechanical Song: Women, Voice, and the Artificial in Nineteenth-Century French Narrative (Stanford: Stanford University Press, 1995); Claire Kahane, Passions of the Voice: Hysteria, Narrative, and the Figure of the Speaking Woman, 1850-1915 (Baltimore: Johns Hopkins University Press, 1995), Women: A Cultural Review, 7 (1996): 309-16. Noise, a series of radio pieces which I wrote and presented was transmitted February 24-28, 1997 on BBC Radio 3. 'Transcripts: Law, Literature and the Trials of the Voice', New Formations, 32 (1997): 60-76. 'Voice, Technology and the Victorian Ear', in Transactions and Encounters: Science and Culture in the Nineteenth Century, ed. Josephine McDonagh and Roger Luckhurst (Manchester: Manchester University Press, 2002), pp. 16-29. 'The Decomposing Voice of Postmodern Music', New Literary History, 32 (2001): 467-83. 'The Strains of the Voice', trans. (into German), Holger Wölfle, in Phonorama: Eine Kulturgeschichte der Stimme als Medium (Berlin: Matthes and Seitz, 2004), pp. 158-72. Other essays on sound and voice can be found in Seeing to Sound: On Sound, Music and Voice, a collection of my web essays.